Since its inception in 1987, Oceanco has specialised in building sophisticated custom yachts from 80 to 140 metres in length, offering a highly personal service to clients, with state of the art yacht-building facilities in the Netherlands complemented by a design, sales and marketing office in Monaco. All of Oceanco’s yachts built since 2007 have the distinction of appearing in “The World’s Top 100 Yachts” list; the 82 metre Alfa Nero, the 85.5 metre Seven Seas and 91.5 metre Equanimity, to name only a few. The 85 metre Aquijo is Oceanco’s first delivery in 2016 and the industry’s largest ketch, which will soon be followed by an impressive and innovative 105 metre three masted Dyna Rig. Several superyachts are currently under construction and continuous research and development is wrapped around the constant search for new shapes, materials and technologies. 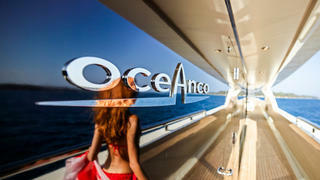 Oceanco is conscious of the environmental impact of building, owning and operating a superyacht. 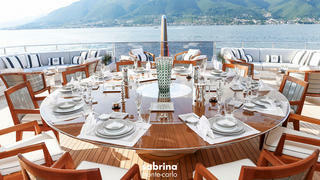 Oceanco is pleased to support the Young Designer of the Year Award again, in conjunction with Boat International Media. Winning this prestigious award is an important milestone in the career of student and trainee designers. At Oceanco, we follow new design talent with great interest and are pleased to be able to encourage and celebrate their vision. Founded in 1995, Sabrina Monte-Carlo is a recognised exterior and interior decorating firm with a network of five showrooms from Monaco to Saint-Jean-Cap-Ferrat. Having decorated over 100 yachts and working closely with the world's leading shipyards, naval architects and interior designers, yachting expertise is deeply anchored in the company's DNA. Aspiring to be a one-stop destination for all furnishing requests from yacht owners and crew members, it offers a wide selection of furniture, fabrics, linen, tableware, accessories & amenities from the most prestigious manufacturers.Some of the latest furniture pieces of Paola Lenti will be showcased at the Superyacht Design Symposium venue. The reactive and multi-lingual team including architects, designers, fabrics and tableware specialists aim to provide its clientele with the most complete service. From research and advisory, to the design proposal, the ordering process and finally the delivery and installation, the team strives to offer its clients the products that fit their needs and taste the best. With over 20 years of direct sector experience, Clyde & Co understand the superyacht industry and its potential challenges, offering a boutique and tailored service to all of their clients. 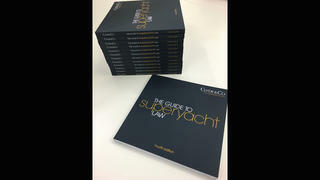 Clyde & Co's lawyers provide legal advice across every aspect of superyacht law. Clyde & Co add value to their clients by using sector experience underpinned with legal knowledge to truly get the best results, even if this means having to address issues from a less traditional angle. As a firm, Clyde & Co has a resolute focus on the core sectors of marine/shipping, financing, insurance, aviation, energy, infrastructure, and trade. Combining their practice excellence and deep industry knowledge, they provide clients with a distinct competitive advantage, bringing together legal expertise, commercial insight and close professional support. Videoworks is a leading company in the field of systems integration. 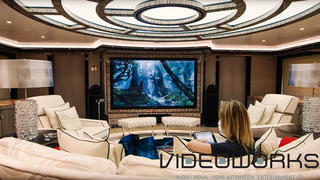 It specialises in the design, production and installation of high-end home automation and audio/visual systems, software, networks, video surveillance and advanced lighting engineering systems. Thanks to its expertise and 360-degree experience, Videoworks can offer its exclusive clients a complete system architecture made of hardware and software with ad hoc after-sales contracts to always assist the client in every place/situation. Its systems are easy to manage and are created with the purpose of offering the best experience to the end users who can boost their wellbeing and on board quality life. Videoworks’ staff is exclusively made up of audio/visual professionals, but also true longtime enthusiasts who contribute to creating their renowned concept of “artisan technology”. The company has international offices in Aalsmeer (The Netherlands) with its “Videoworks Europe BV” company, as well as in Ancona, London, Milan, Moscow and Viareggio. Headquartered in Hong Kong, with 14 showrooms across Europe, Asia and North America, House of Tai Ping covers every sphere of the residential and hospitality markets. Each of our five distinctive brands – Tai Ping, Edward Fields, La Manufacture Cogolin, 1956 by Tai Ping and Carpets Inter – creates bespoke rugs and textile floor coverings designed and customised to the unique vision of our clientele. We have won international renown with our innovation and expertise steeped in a rich history, a celebrated archive, unparalleled design and service to the world’s most discerning clientele. House of Tai Ping extends our cultural legacy into the present, continuing an exceptional tradition of craft and dedication to innovation in every facet of carpet design and manufacturing. This spirit of excellence is evident in each of our products and every aspect of our customers’ experience. Promemoria is a family-owned company, creating luxury furnishings in the finest tradition of quality Italian craftsmanship. Founded in 1988 by Romeo Sozzi, cabinet maker and designer, the company makes luxury furnishings and its roots lie in the craftsmanship cabinet-making tradition which spans four generations of the Sozzi family. Romeo Sozzi is the creative spirit of Promemoria which he personally directs together with his sons, Davide, Paolo and Stefano. 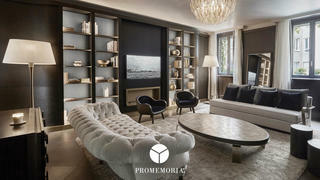 Sensibility and culture, constant experimentation, research, attention to detail, skill and knowledge of Promemoria’s people are the unique combination that has defined the company’s individual style of timeless elegance. The materials are the finest woods, ancient metals like bronze, natural woven fabrics in silk, wool, cashmere, cotton and velvet, leathers and galuchat. Each finished piece is studied and refined to the last detail, creating something utterly exclusive. Promemoria creations are now exported all over the world and, over the years, the company has become a point of reference in luxury and design circles when it comes to making items with special finishes for the most demanding and sophisticated clients. JFA Yachts is a French based yard, founded in 1993, that built itself on a familial atmosphere and personal approach. Fully immersed in the performance sailing yacht scene, the “boutique” yard can draw from all the expertise rich in the region, including specialists in pre-preg carbon. Yard’s greatest strength is its great versatility in building or refitting both custom sailing yachts and custom motor yachts from 70’ to 200’ either monohull or multihull, in Aluminium, Steel or Composite including Carbon. 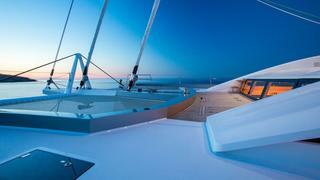 Some years ago, JFA Yachts developed a semi-custom catamaran range. In 2016, JFA Yachts presented a new Motor Yacht Explorer project of 38m named Arcana with Axis Yacht Design. JFA Yachts is actually building a 135’ Motor Yacht, a 70' Fast cruising monohull, the 2nd Long Island 85' and the first Long Island 100' sailing catamaran. Exceptional infrastructures with highly qualified craftsmen also makes JFA Yachts the ideal shipyard to handle the most important refit projects. After boat show, Design Symposium and Design awards are very important events for our yachting industry and JFA Yachts is proud to be a sponsor of this Showboats event since 2014. Ideally located in the South of France and on the Atlantic coast in La Rochelle, Compositeworks is an award-winning shipyard delivering world-class yacht refits and complex rebuilds. 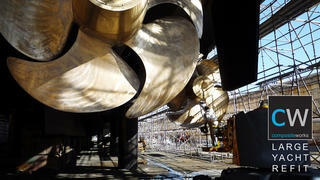 Since its establishment in 1998, Compositeworks has delivered over 800 projects, including over 25% of the world’s megayacht fleet (over 85 metres) and forged an international reputation for first class new build quality, excellent technical knowledge and innovation as well as a sector leading commitment to redelivery times. Compositeworks’ international team of over 120 professionals combined with a pool of carefully selected international and local contractors ensures that alongside the requisite quality, the communication and flexibility required to succeed in the best rebuild and refit projects is unprecedented. Today, Compositeworks is one of the most trusted refit shipyards in the world, and counts many of the world’s largest and most prestigious vessels as repeat clients. DKT Artworks is an accomplished team of artists specialising in bespoke artworks and decorative finishes. They work in the marine, commercial, residential and hospitality markets. A track-record stretching back 35 years and an extensive client list are testimony to their enduring creativity and consistent quality. 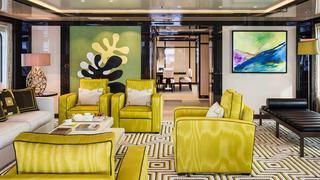 They produce one-off artworks, limited editions and an inexhaustible range of decorative finishes, as well as the occasional piece of specially commissioned furniture. Today, many of these have to comply with the stringent safety and technical requirements of the marine industry, whilst maintaining the distinctive character their clients expect, and the company has built up a wide knowledge of suitable materials. By any standards, the range of skills they offer is formidable. Working with paint, stucco, wood, metal, glass, acrylic, gold leaf, fabric and lighting, and combining traditional skills with the most modern techniques, their impressive portfolio includes sculpture and bas-relief, verre églomisé, murals & trompe l'oeil and handcrafted mosaics. For the second year, DKT will present the Judges' Commendation Trophy. Based on the wake created by a yacht, with the shape evolving into the traditional winners’ laurel, this has been designed and carved by DKT, then cast in silicon bronze. The essence of the KORMARAN is to transform, to convert itself. To perfectly adjust to every situation. 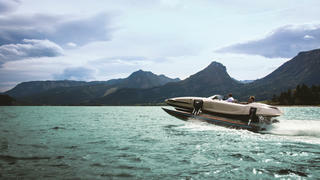 The KORMARAN K7 First Edition combines optimum comfort with safety, power and elegance. Whether gliding, driving or flying the K7 FE, unique experiences and driving sensations can be expected. The transformation system is a groundbreaking innovation, allowing the Kormaran to change the distance between the hulls and the height of the central passenger cabin. In this way it allows the variability and the multifunctionality of the vessel. While conventional boats cannot change their characteristics, the Kormaran can transform even while in motion, elegantly combining the agility of a monohull for quick maneuvers with the stability of a catamaran or trimaran. In addition, the K7 FE can gracefully transform into a large sunbathing island, without compromising transport or storage space. Founded in 2010 in Salzburg by Dr. Oliver Kormann and his wife Jutta Kormann, KORMARAN GmbH produces the most transformable superboat on the market. The philosophy of KORMARAN is bringing together the values of high-class design, meticulous precision and high-quality craftsmanship, leading to absolute perfection in every detail in styling, design, materials and technology. Furthermore, social responsibility is taken for sustainability in nature, culture and, of course, for employees and their families. The company is continuously growing and today has a team of 25 people in development, design and operations.